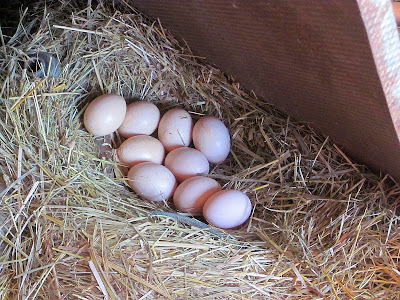 Our hens haven't been laying as much lately. They're getting on the older side (about three years) so that's to be expected. We've been seriously thinking about offing the flock and starting fresh. 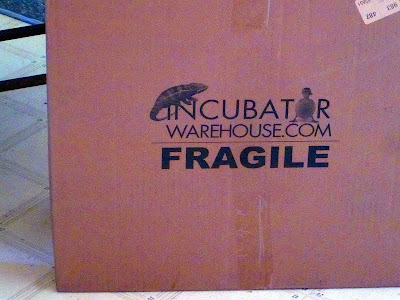 In fact, it's been in the back of our minds since last fall, when we made a purchase we've been meaning to make for quite awhile: an incubator. This particular incubator holds 42 eggs. ...until I happened to walk into Matilda's pen, which has been vacant for several weeks now. Oh, so THAT'S where they've been laying. We also found another, smaller nest near Don's shop. With a sudden abundance of eggs, we decided to proceed with our plans to raise a new flock of chicks. We're not sure how old these eggs are nor how fertile they may be, but we decided to give it our best shot. So Younger Daughter collected 42 eggs out of the pile. Most of the eggs were quite clean, but a few had dried-on yolk (from a broken eggs some time ago) and needed to be washed... otherwise a baby may not be able to peck itself out of the shell with the gluey dried yolk plastered on it. Eggs need to be kept in a humid environment during the incubation period. 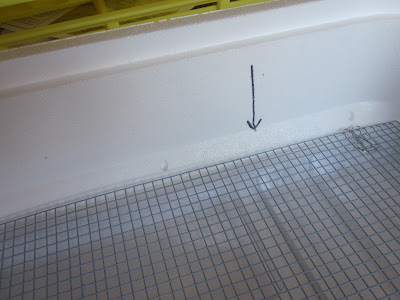 The incubator came with shallow built-in reservoirs for water, but since the opening to the reservoir is hard to see under the mesh, I put a black arrow on the Styrofoam. 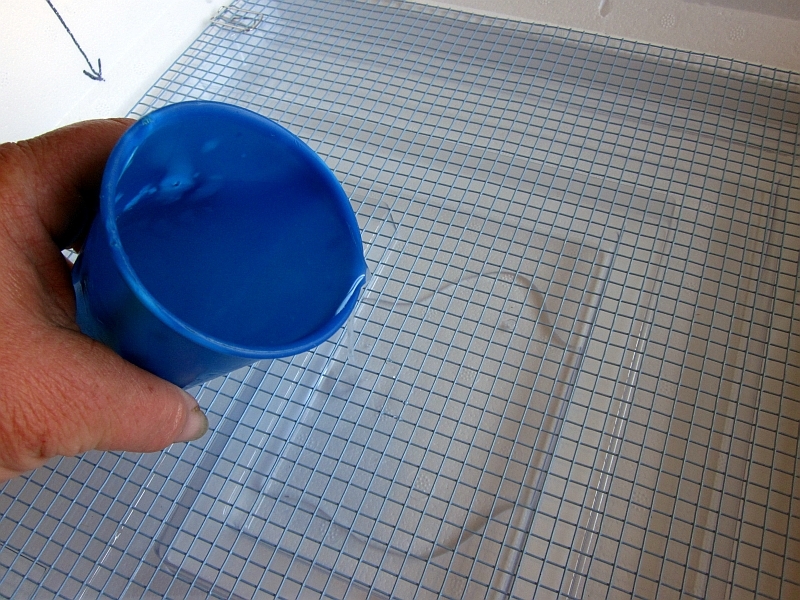 I filled the inner reservoir with water. The outer reservoir gets filled a couple days before the eggs are due to hatch. 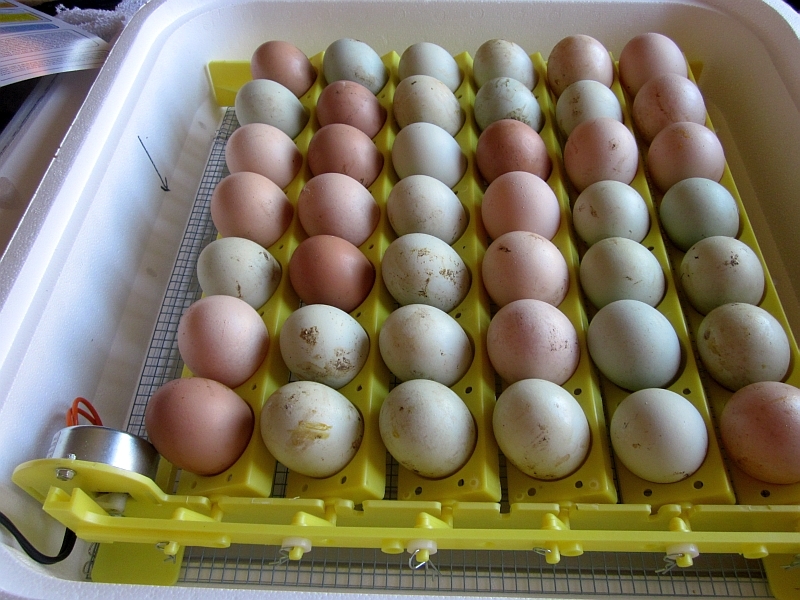 Younger Daughter and I set up the incubator, and she carefully loaded the tray with 42 eggs. 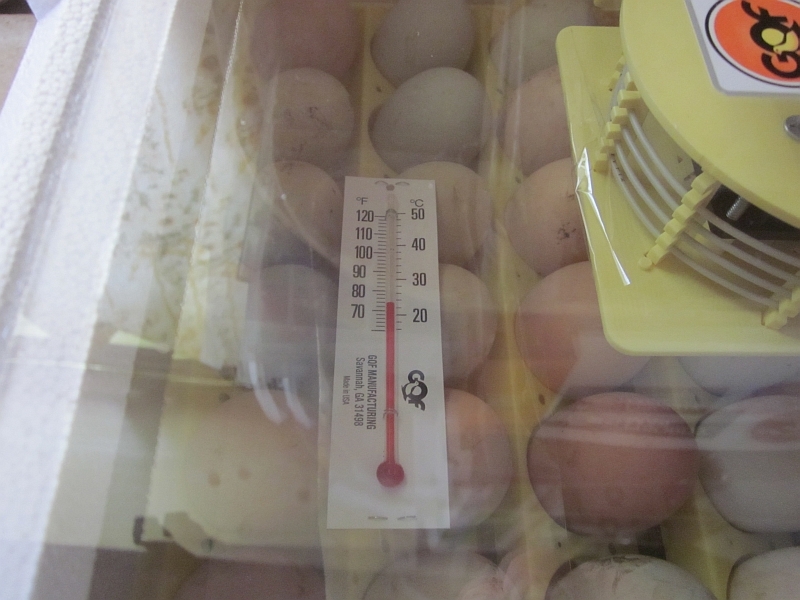 The incubator maintains a constant 100F temperature and even automatically turns the eggs. Here the incubator is set up and starting to reach the optimal temperature. The thermometer lies over the eggs and is visible through the window. It took about three hours for it to reach 100F. We set the incubator up on Monday June 25. 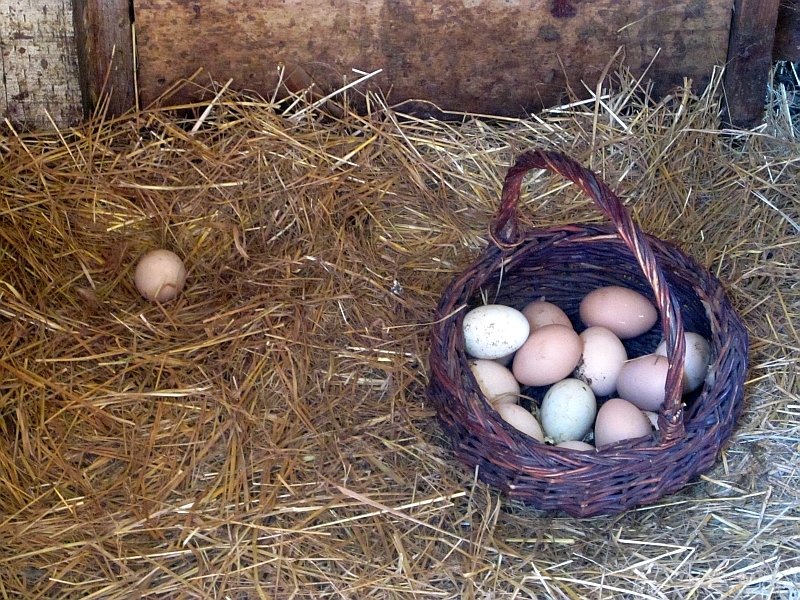 It takes 21 days for chicken eggs to hatch, meaning their hatch date is Monday July 16. Three days prior to their hatch date, we'll remove the eggs from the turning tray and lay them directly on the mesh screen, fill the second reservoir, and get a brooding area ready for any newly-hatched chicks which may result. Since we didn't know the age (and therefore the freshness) of these eggs, I tested them by putting them in a pan of water. If the egg sinks, it's fresh. If it floats, it's bad. If it's sorta halfway (standing on end), it's questionable. Four eggs were questionable, so I tossed them. We'll find out in a week and a half whether any of the eggs are any good. Stand by! 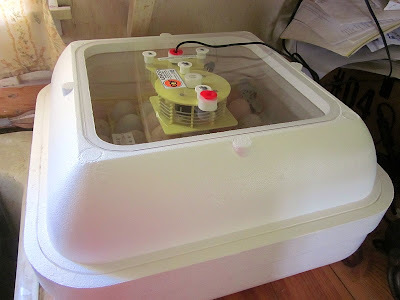 I bought that same incubator and my first batch of Ancona ducks are due to hatch tomorrow. Keeping my fingers crossed! Hope your hatch goes well. 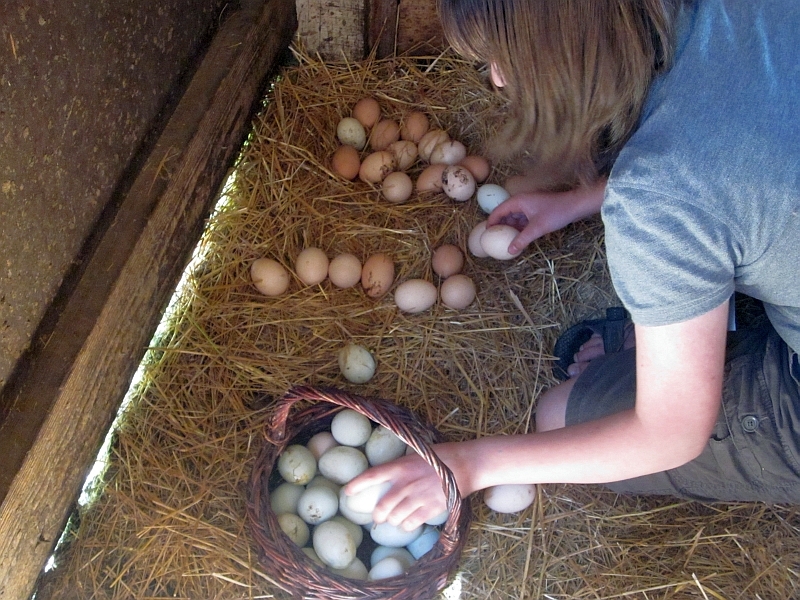 We're not living at our ranch yet, but when we do - is having an incubator a necessity? The wild chickens in our neighborhood always seem to be able to hatch their own chicks. I know we will not only want eggs, but will want the meat too. 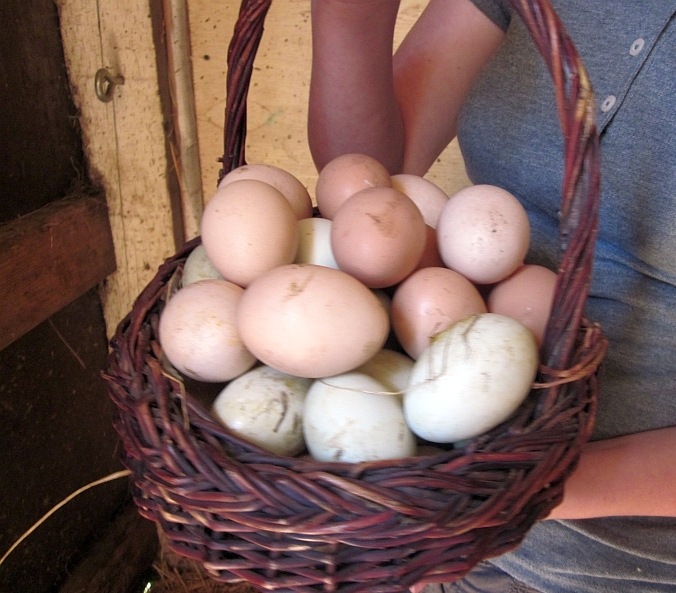 :) what happened to not putting all your eggs in one basket? Hi, Patrice, There are some things you need to keep in mind. 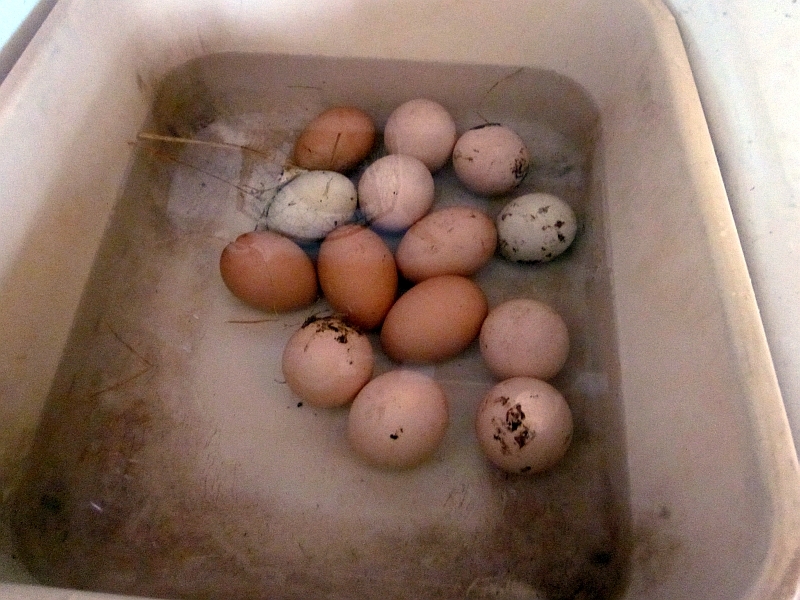 When you wash eggs to incubate don't keep them in the water longer than 3 minutes. I have used an earlier model of your incubator and you need to check your water level once a day.Another thing that really helps is a decent hygrometer. I got an Accurite thermometer/hygrometer combo for $5.00 that is very accurate. The humidity is extremely important thruout the incubation period. Hope this helps. Did you read the directions? If you get any I would be surprised! Could you elaborate on that? Why would you be surprised? There really is more to it than filling up the egg turner and plugging everything in. I have the same unit as you and some years run 5 or 6 "loads". Anyway I have appx 45 hens and 3 roosters. 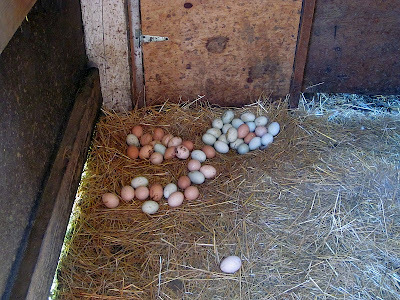 Eggs laying around a barn would be iffy to use. Yours were very dirty. You then washed off their protective coating. 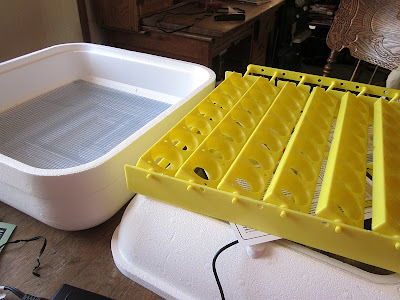 It's best to collect the eggs you need, and you can either put them directly in an already up to temp unit or put them in an egg carton, small end down, and/or collect the rest you need and put them all in together. The water level in the bottom is extremely important. Humidity is a vital step especially at the end. I have done this MANY times and it's always amazing to watch the process. Another "life lesson" is some chicks pop right out of the shell, others struggle, some give-up on life and never get completely out. After watching them struggle out of the shell it's hard to "whack" the roosters so I don't (I have no problem when they are older and chasing the hens down if you know what I mean)! 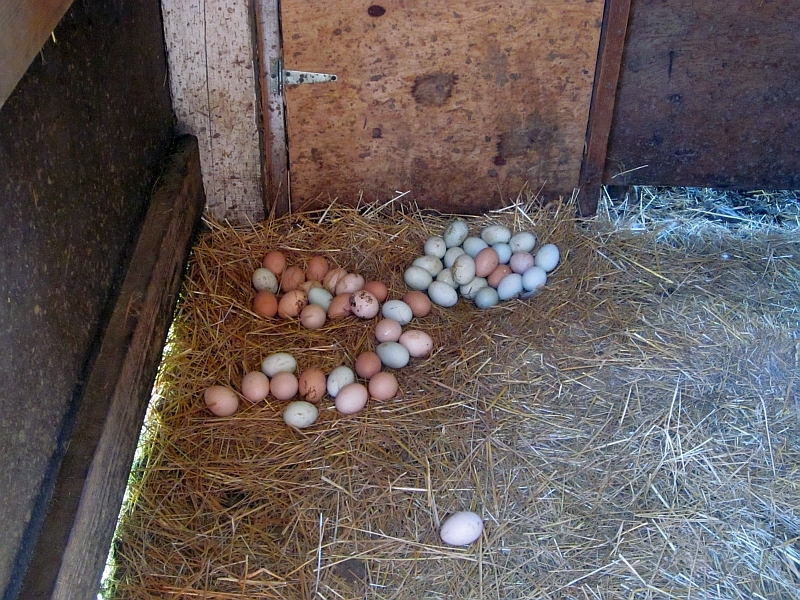 You may "luck out" and get a few if the eggs were fresh but don't be disappointed if your numbers are down. I also think that the GMO corn is affecting roosters sperm count nowadays, imo. About the protective coating on eggs they do keep longer if you don't wash them. If I get a poopy one I automatically give it to the dogs. I don't have a muddy problem like you'all probably do up north but I do try and keep the girls house very clean. Hope this helps. Some of the other comments are about broody hens. Yes God's plan is ALWAYS best. They make it look so easy. I have 2 mommy's sharing 5 chicks and those 2 would take on goliath, crows or the dogs and most likely win. I put a bit of banty "blood" in my hens so I always have somebody who wants to be a mommy. Yes, you know the outside of the egg has a water proofing coat to prevent the egg from dehydrating, so washing egg is not a good idea. The temp is 100 degrees, no lower, right? I had a little lower temp before and had splayed legs upon hatch. Hope everything turns out well. We just had our first broody hen hatch 2 out of 6 eggs. It's amazing to watch her take care of them. Here's hoping everything turns out good. We've just had our first broody hen hatch out 2 (out of 6) eggs. It;s amazing to watch the interaction with them. Anyway, the hyrgometer is a good idea. Keep the humidity low until the last few days when they're getting ready to pip. This is fun! I hatched a batch out with my incubator a couple years ago, and am thinking it's time to start a new set as my sweet hens are getting older as well. I had the luck of having one of my first (bought as chicks) clutch go broody - she hatched out and raised a set of chicks and it was absolutely fascinating to watch her. She would come strutting out all puffed like a tom turkey, her wing tips dragging the ground, clucking ominously at the other chickens - they all gave way when she came off the nest to feed. 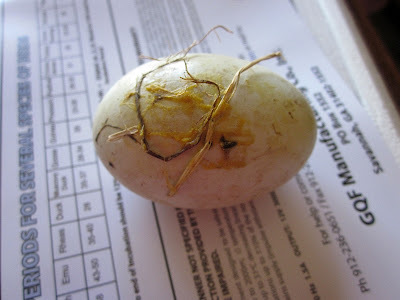 I have been hoping to have another go broody but no luck so far. I also learned to look for hidden nests when the egg production drops all of a sudden, by the way. And even though I know it makes more sense to cull the old hens - I just let them live until they drop. The older they are the tougher their meat, and they don't cost much to keep - and they have given me delicious eggs all their adult lives so I leave them to live out their retirement months at their leisure. That would change if I or my family or neighbors were hungry, though. Thanks for the neat trick - I didn't know you could test eggs for freshness that way! "...offing the flock." Wow, that one made me laugh! I don't like to leave eggs out too long in our heat. 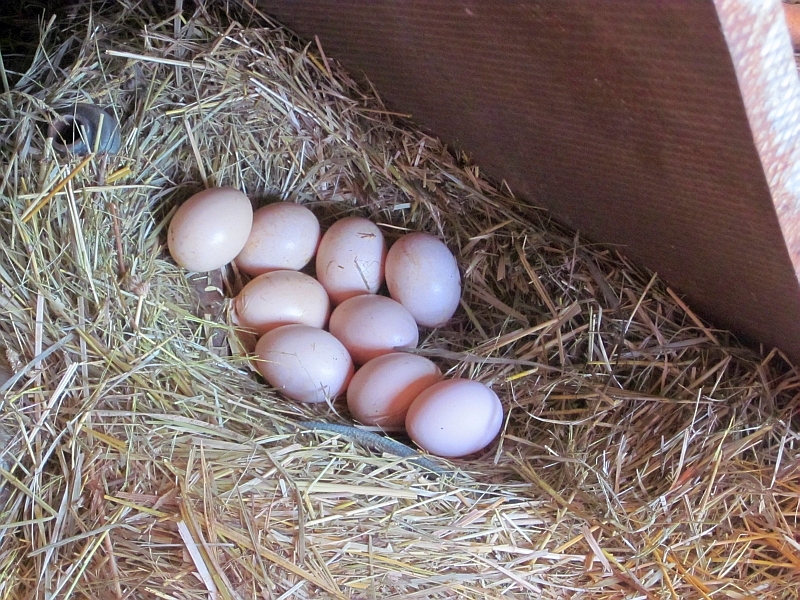 So instead of nest eggs we keep a few golf balls in the nest boxes, or where else we'd like to keep them laying. Has worked well so far. We've not yet a had a hen go broody. Am leaning toward getting a few bantams strictly for hatching as I've heard from others that bantams will even set turkey eggs. How exciting! I have this exact incubator! 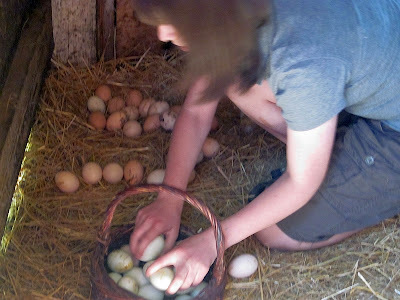 I currently have 38 guinea hen eggs that I'm trying to hatch. I've never done this before! With any kind of egg! I've candled them and do believe that I probably have about 14 that are actually developing. A few are questionable, and a few others are certainly not fertile. They are 11 days along in the incubator. Think I'll use the "water test" on the questionable eggs. Good luck! How exciting! I have this exact same incubator and currently have 38 guinea hen eggs "cooking". I've never done this before! There are a few that are questionable when I candle them - think I'll try your water test. Good luck!